As I mentioned in a previous entry due to my body type and weight the Prologo Kappa saddle was not working out for me on my Cannondale Synapse Carbon 5 105 road bike. I was experiencing pretty serious discomfort and numbness in my man parts. The Prologo Kappa had to go. Having been down this road before I was quite tempted to purchase a Selle San Marco saddle which has worked well for me in the past but what fun would that be. This time around after a lot of research I decided to try a Selle SMP Extra Saddle. According to the manufacturer the Selle SMP Extra Saddle has a centralized channel that allow your nether region to come in contact with absolutely nothing. 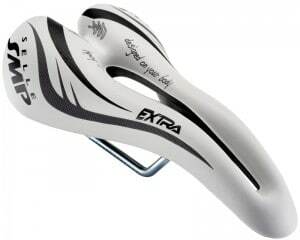 The Selle SMP Extra Saddle also features a very unique beak shape at the front of the saddle. This beak shape allows your man parts to remain squish free with the added benefit of easier saddle entry and exit. The “Extra” signifies a slightly larger saddle for bigger folks. I’m 6 foot 225 pounds. That is a lot of weight in a small spot. Below is a video of a similar model Selle SMP Extra. On the road with the Selle SMP Extra Saddle two things be came apparent right from the start. The first is saddle entry is fantastic. It’s so nice not getting my shorts stuck on the front of the saddle. Not sure if this is a common problem but it’s a constant problem for me. The next thing I noticed was the saddle is quite slippery. Not sure if that a good or bad thing but it made me realize the Prologo Kappa was not slippery. On a mountain bike I like a slippery saddle and I think in time I will see this as a benefit on this saddle as well. The Selle SMP Extra Saddle feels pretty good. After several 15 to 20 mile rides I experienced no pain discomfort or numbness. Make no mistake it’s not like floating on air. You know you are on a bike saddle. The Selle SMP Extra Saddle is comfortable enough that you forget about the saddle so you can concentrate on other aspects of your ride such as why your GPS isn’t working and where can I launch the bike if the driver of that car doesn’t stop texting. All in all I’m quite pleases with the Selle SMP Extra Saddle. It was pretty low risk at a cost of $106 at Amazon.com. Selle offers the SMP in a non “Extra” size for regular folks. The Selle SMP would work equally well on a mountain bike. There are also female specific versions of the SMP.